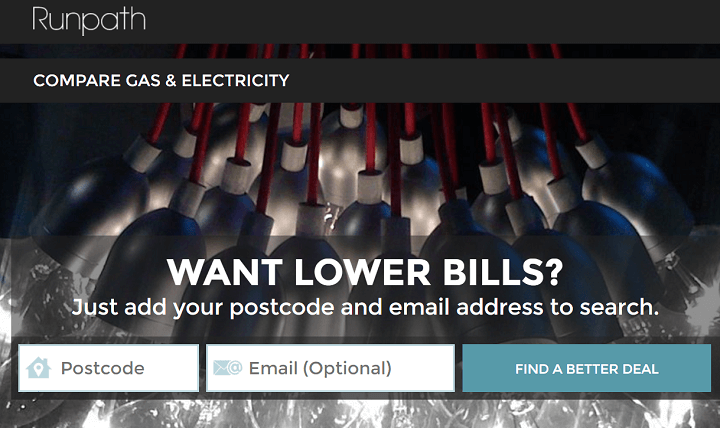 Runpath Energy Reviews: The Best Gas & Electricity Comparison Site? Runpath is a digital company that offers a platform for comparing energy companies. Compared to many others in this sector, Runpath uses a more modern and tech-based approach, with a website that is contemporary and slick. However the overall approach is very similar to that used by other companies. Runpath’s energy comparison site arm doesn’t appear to have a review presence online, however it is mentioned on several review-type blogs as being a suitable place to carry out a comparison due to its Ofgem accreditation. The website is split into two main sections – one that details the energy companies that they work with and the other highlighting their commitment to Green Tariffs. These Certified Green Energy tariffs are highlighted in their comparison tables, allowing customers who care about the environment to choose the best option – even if it is not the cheapest. The certification scheme is governed by the Green Supply Guidelines. The website offers further links to details about the green Deal, the Energy Saving trust and the Energy Grants Calculator. Although the Green Deal is no longer in existence. Runpath describe themselves as a creative FinTech company that works with other companies to provide them with financial services tools – such as comparison tools such as this. Additionally they make their money from the commissions that they get from the energy companies. However they carefully point out that the money they make does not influence the tariffs that they offer – they are obliged to show the entire market (even those companies that do not offer commission) and the customer can choose to see only those that can be applied for through Runpath if they wish. They offer a similar switching service to other companies – either taking the customer through the process and informing the old supplier or they advise of the best tariffs and allow the customer to approach the new supplier themselves. Runpath is fully accredited under the Ofgem confidence code so that customers can be sure that they are impartial and independent. If customers wish to make a complaint about their service they are directed to the European Commission Online Dispute Resolution procedure. This can be used if they are unable to solve any issues. The details of the ombudsman are also listed for anyone who has ongoing unresolved problems. Runpath also seems to be known under the banner of Lovemoney.com where it is possible to find comparisons of a variety of different financial products and where there is plenty of information relating to consumer finance. The Runpath energy comparison service is a relatively small part of their business – which mainly appears to deal with offering financial services products to other companies. For this reason, the company shows up in the media from time to time. Most of these appear to be related to banking and loan comparison apps and platforms that have been designed by Runpath and licensed for use by other companies. Runpath is a digital financial technology company before it is a comparison site. The comparison side of its business seems to be an offshoot of its main business providing similar platforms for other companies, such as Lovemoney. For this reason there is very little information to be found on its website regarding its role in the comparison business. Customers are likely to get an efficient service due to the well run platform, but there is a lack of information relating the service and no detail on the energy sector that is found with other similar websites.